Who knows Shinseki from Shinola? Problems with obtaining medical treatment for veterans from the VA have been perennial. But the quality of service is spotty. Some VA facilities are noted for providing top medical services to their patients. Others have perennial problems and are snarled up in the dysfunction that bureaucracies tend to breed and promulgate. South Dakota has had its problems. My spouse is a former staff member for Sen. Daschle and Rep. Herseth Sandlin. As I am a veteran, as was her father, she often related problems with health care that veterans asked for help with from the congressional staffs. Tom Daschle, a veteran himself, was a national leader in solving problems veterans faced. When the Department of Defense and VA denied that Agent Orange had inflicted harm upon soldiers exposed to it, Tom Daschle mounted a campaign among medical authorities and affected veterans to make a scientific investigation into Agent Orange and how it affects humans. That effort led to the recognition of injuries and damages caused by Agent Orange and required the VA to provide diagnostic services and treatment for it. That experience with Agent Orange laid the foundation for recognizing Post Traumatic Stress Syndrome as an illness caused by experiences in the military service. South Dakota has had its difficulties with the VA. A case that comes to mind because my spouse was involved in working on it was the problems veterans in the Aberdeen area had with access to VA medical care. They had to travel the 200 miles to Sioux Falls, which imposed a tremendous burden when follow-up care was required. The congressional staff filed its regular reports on their work with veterans and the issues they faced and they registered on Tom Daschle. They recognized that for effective and quick treatment, Aberdeen needed a VA clinic. The funds and orders were arranged by Daschle and Aberdeen now has a clinic staffed by local medical personnel. Sen. Tim Johnson supported and participated in the efforts to provide medical care to the veterans. Following Tom Daschle’s lead, Herseth Sandlin also made veteran’s issues a priority in her efforts to serve her constituents. Alas, we do not have that kind of attention paid and effort exerted by our Congressional representatives. That attention involves monitoring the VA facilities to see that they don’t fall into bureaucratic dysfunction. Bureaucracies in their management tend to bring out the worst in humankind. Not just government bureaucracies. Corporate bureacracies are the worst. The problem with Gen. Eric Shinseki is that he was a general. He gave an order that any veteran seeking medical help from the VA must be provided an appointment within 14 days. When a general sends down such an order through the chain of command, subordinates will make it happen or their asses will be roasted on an open fire like Christmas chestnuts. Gen. Shinseki assumed that an order sent down the VA bureaucracy would be treated like a general order issued in the army. It did not seem to occur to him that if the bureaucracy hit some snags, the bureaucrats would not inform him, but would create a way to hide their nonperformance so they would not jeopardize any bonuses coming to them. Their greed and dishonesty had a higher priority than ailing veterans trying to get treatment. The New York Times has a record of reports detailing problems within the VA dating back 15 years. When we had Congressional representatives who actually monitored and acted upon veterans’ affairs, progress was made. But now two of our three Congress people only make the set speeches provided them by party hacks regarding the intrusions of government into healthcare, and they vote against appropriations that would help bring the VA up to an effective standard of service. Neither do they have staff members who intervene when veterans need help in obtaining treatment and who report their work so their bosses in Congress know the issues involving the VA. While some personnel in the VA did not do their jobs and ignored veterans to pursue their greed and dishonesty, while withholding information from Gen. Shinseki, the real culprit is Congress. Unlike Tom Daschle and Stephanie Herseth Sandlin, they did not do their jobs and carry out their responsibilities. But they are what the people of South Dakota want. The most sentient diagnosis of education yet printed. The most incisive analysis of what is wrong with education published. Voter registrations in South Dakota continue to rise for Republicans and Independents while Democrats plummet. That is true here in Brown County, which has historically been a Democratic stronghold. It is hard to determine just what accounts for the shifts in registration, as the changes in registration from one party to another are not tracked, so the reasons and patterns of motivation behind the registration figures are left to speculation. The registration figures have an economic and social context. I have noted often, after maintaining a list of the most active Democratic voters in Brown County, that Democrats are leaving the state physically through attrition and mentally through disaffection. In Brown County, a staff member of the Aberdeen Development Corporation told the county commission that companies are hesitant to locate in the community because of a shortage of workers. That statement must be seen in the context of the bankruptcy and closing of the Northern Beef Packers which left workers who had moved to Aberdeen for the jobs were stranded with little chance of finding other jobs in the state. The failure of the beef plant and the attitude towards workers that prevails among Brown County businesses are strong signals to workers of the kind of thinking and mindset that defines the life offered to them. But the hard data about wages and living expenses sets the foundation for why there is a shortage in the workforce and the decline of Democrats in Brown County and the state. If one takes the range of wages offered for what jobs are available in Aberdeen and adds up the costs of housing rental, utilities, food, transportation, clothing, and necessary incidentals, one finds that the wages fall far short of covering a subsistence level of living. A colleague and I worked on an analysis of wages in the Aberdeen area to determine if it is possible to live on the prevailing wage scale for available jobs, which is between $8 and $10 an hour. In rounded numbers, a person at $8 an hour earns $320 a week, $1300 a month, $16,640 a year. A person at $10 an hour makes $400 a week, $1730 a month, $20,800 a year. Our goal was to apply documented cost-of-living figures to the wages earned and see if the costs were covered. We obtained information from a number of young people and confronted a problem. The generalized figures for cost of living did not match up with the actual experiences of the workers. An example was in rent. Most of the single young people who supplied us data shared apartments or houses with other singles. There was a very common experience among them. A housemate decided to move away for better opportunities and the remaining tenants or tenant had to cover their share of the rent when they left and pay to fulfill the terms of the lease. They found themselves in financial difficulty. Housing is a problem. Many years ago while I was working at NSU, the student services ended maintaining a list of approved off-campus rentals because it found so few it could approve. In recent years, Aberdeen has had a surge in apartment units to provide alternatives to old structures converted into badly designed, poorly maintained, squalid, and over-priced units. The problem is that the newer units start at $800 a month plus a month’s rent deposit, which is not possible to manage for one person earning $1300 a month and half of that, if an apartment is shared, doesn’t leave much to cover the other necessities. Absolutely Aberdeen, a promotional organization for the city, advertises that 1,000 jobs are available in Aberdeen, but it does not reflect the nature of those jobs and the pay scale and what kind of life they support. I have talked with numerous people engaged in job hunting, and none of them can understand where that 1,000 figure comes from. Many young people who provided us with case data on their employment status have to get financial help from government agencies or their parents to manage financially and cover a subsistence existence. The steep rise in food costs also hits those low-wage budgets hard. That does not include restaurants, which struggle in Aberdeen. Two once-popular restaurants closed since the first of the year. Groceries, especially meat and produce, have experienced a sharp increase and more is projected in economic forecasts. Even the proverbial idiot with a hand calculator can figure out that the majority of jobs in Aberdeen cannot support a person to cover the necessities, let alone offer any kind of a future. That holds true throughout the state. So, people leave or keep working at low wage jobs while trying to save up to make an eventual change. Most of those who we have talked with about the job situation think it is so rooted in the culture and provincial mindset that there is no effective political action that can change it. They feel like they are forced to leave the state because the opportunities to develop a well-paying, satisfying career do not exist in South Dakota. The prevailing mindset clings to a conservative notion that rejects social and intellectual progress and believes in an ethic that the only good is making money. People who do not subscribe to the money-is-power ethic are considered unworthy and not deserving of consideration. And those who receive the signal that they are unworthy have no interest in the place that regards them that way. While there are good, intelligent, and beneficent people in South Dakota. its politics and culture have a malignant, belligerent strain that poisons and characterithzes the social atmosphere. And the people most aware of it are those with liberal leanings, and they are becoming convinced that if they are to have possibilites in the future, South Dakota is not the place they will be found. The dominating sect worships the gospel of ignorance and hate spewed by Rush Limbaugh and his imitators. Limbaugh is to America what Joseph Goebbels was to Germany. However, his target is not Jews but liberals. He uses the same propaganda techniques of defamation, misstating and distorting facts. generally preaching a message of hatred and vicious malevolence. The sect in South Dakota, which often claims Christian principles, devoutly preaches and practices his gospel, despite the fact he is the antithesis of anything Christ taught. Democrats have not confronted the ills of South Dakota They express their love for the state, insisting that it is the nice and lovely place they see in their memories and their hopes. They have not faced what the state has become as reflected in its state legal code which endorses secrecy in government, has cemented a corrupt state-corporate relationship, and systematically strips education and worker opportunities in its attempt to create a subservient class of worker drones. And so, those who observe and understand what the state has become leave or make plans to do so. And their decisions are reflected in the voter registration numbers. California Chrome has won the Kentucky Derby, the Preakness, and is heading for the Belmont Stakes to try to be the first Triple Crown winner in years and years. Horse racing has a culture of superstition abounding in it. New York Times racing writer Melissa Hoppert has a great story about its prevalence on the race tracks. Just as silly as some of these superstitions about horse racing may seem, what passes for wisdom or whatever in political campaigns is. even sillier. Every blogger and commentor seems to think they know what it takes to win an election. They argue endlessly citing misinformation, demonstrating ignorance, and ignoring the fact that little that they tout as strategy has an effect on the voters. The voters vote their own ignorance, their prejudices, and knowledge of the issues and candidates' attributes guide only a small minority of them. Horse racing is superior. Horsemen weigh the records and attributes of the horses in assessing potential winners. The vast majority of voters assess nothing but their own preferences and attitudes toward their fellow humans. 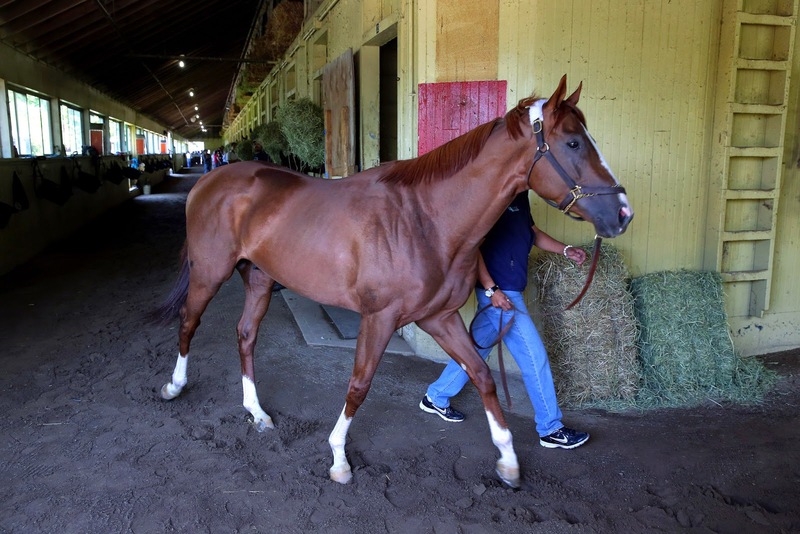 California Chrome has four white-stocking (chrome) feet. That is considered bad luck in racing. His origins are humble. Most good brood mares cost over $100,000 and the stud fees are astronomical. Chrome's mama cost his owners $8,000 and the stud fee was $2,000. He defies the superstitions and the conventional notions of good breeding. South Dakota has some political candidates who are like Chrome. They are sound with strong records of good character and a command of issues, but the quality of their candidacy does not matter on the South Dakota political track. Their qualities and efforts will not determine their success. The fans who vote their prejudices, their ignorance, and their obsessive maligning of those who do not share their prejudices and ignorance decide the winners. Many politicians pander to the ignorance, prejudice, and penchants tor seething hatreds. Many potential winners decline to run for public service in South Dakota because its politics are so dementedly oppressive, as reflected in the state legal code. I for one could not recommend anyone running on this track and admire those with the ambition and optimism to try. I am frankly more interested and hopeful for the Belmont Stakes than the future of South Dakota. The state has accrued a record as the lowest state for integrity, scandals of greed and corruption in state government that the ruling powers refuse to address, and an economy built on exploiting workers. If South Dakota were a racetrack, it would be shut down and not allowed to operate. California Chrome is so superior to those who have made South Dakota what it has become. That's the headline at Talking Points Memo. People love to laugh at other people degrading themselves and acting the fools in public. Nothing is more pathetically degraded than politics in South Dakota, the national laughing stock. "And here's what I'd like to ask Dr. Weiland. Do you tell your patients to wash their hands before they eat? Why? Because you touch a doorknob and you don't want to get it inside your body. I hesitate to get crude again, but Dr. Weiland, is it OK for, you know, eight of your friends that you're in love with to take a dump in your bed and then you can sleep in it all year long?" And people wonder why functioning brain cells depart from South Dakota as if it is a sinking ship. It has already sunk to the depths of human degradation.